One of the methods of preserving is sun drying. In a country like India especially in South India where the Sun shines through out the year, we are all Sun worshipers. Because of him we get our agricultural produce, health, monsoons. 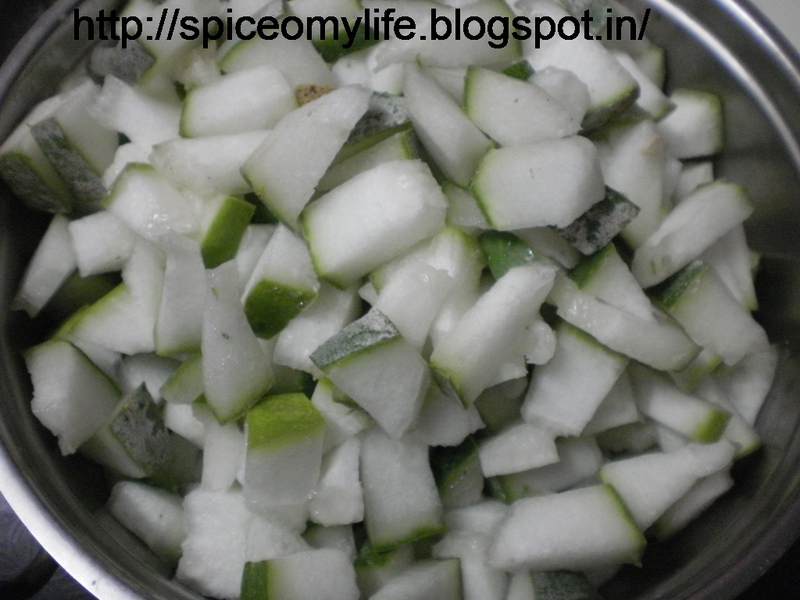 One of the ways to preserve certain vegetables is by making crispies, known as Vadiyaalu(Telugu) or Vadis(Hindi). 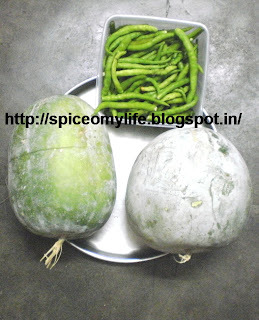 Vegetables are mixed with other ingredients and spices and dried in the Sun. They can be preserved for an year. These are deep fried in oil and eaten with cooked rice and rasam or sambar or as a light snack with tea or just like that in the evenings. These along with Poppadoms are a must in feasts and food served on all important occasions like marriages etc in my State of Andhra Pradesh. In earlier days we had no junk food to binge upon. We used to eat these crispies in the afternoon. They are very tasty and healthy if eaten moderately. These days we can just dab them with little oil and microwave them to avoid deep fries. There are many types of vadiyaalu /vadies. I am starting with those that are made in Andhra Pradesh-my state. These are one of the most popular dishes of Andhra. These are known as Gummadi Kaaya Vadiyaalu. Soak gram over night in enough water. 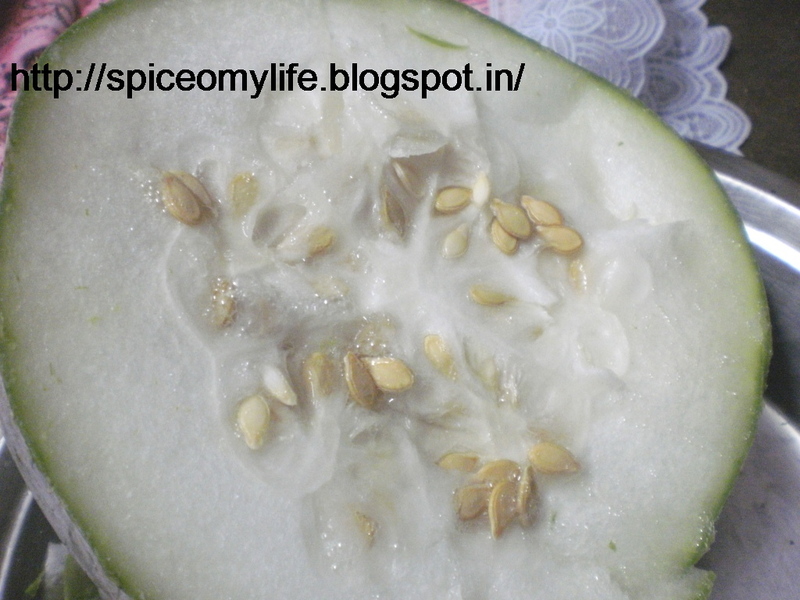 Cut the gourd into pieces the night before.The seeds are generally discarded. Cut into pieces along with the outer rind. I have discarded the seeds, used the juice and the fluffy white flesh while grinding the gram. Put them in a muslin cloth and wound tightly into a bundle. Place the bundle in a platter and place a heavy weight over it. This squeezes out all the juice of the gourd. The platter should be in a slightly slanting position. Keep a vessel under the platter to collect the juice of the gourd. This is left over night. Next day the bundle is squeezed to remove all the juice. Collect this juice into a vessel and keep aside. Next morning wash the gram well with water and leave it for some time so that the water drains off completely. If you are using husked split gram washing with water will remove the husk. But keep the husk separately as it can also be made into crispies. 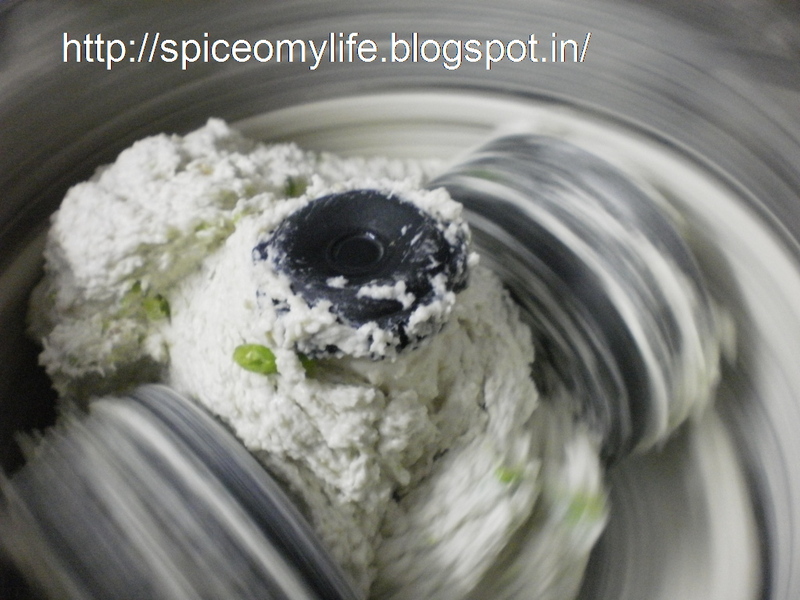 Now grind the gram to a very fine but very thick paste, using gourd juice. if needed a little water can be used. Remove the stalks of the chillies. Cut into pieces and grind to a paste. This way you can add only that much that you require. It can also be ground along with the gram. But here you cannot help if it becomes too spicy. Add the chilly paste, asafoetida and salt when the gram is almost done. Grind for some time. Remove and collect in a big vessel. Mix well taste and adjust the spices. Remember that it becomes more salty and spicy on drying then when it tastes wet. I use wet grinder for grinding the gram. 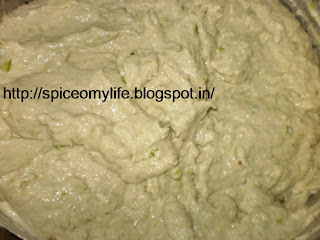 This is how the dough looks with green chillies, salt and asafoetida but before adding the gourd pieces. Now add the gourd pieces mix well. Take a big cotton cloth not too thin. Dip it in enough water. Wring out the water. Lay the cloth on a mat placed on a big table, or on the floor(but it leaves patches on the floor which are not easily cleanable) in hot sun. Take a handful of the dough and place it on the cloth in a pyramid shape and slightly pat on the top. They should not be too flat. There should be enough pieces of the gourd and also dough to bind them. Excess of any of these will not be good. Keep mixing the dough in the vessel every time you take a handful, as the dough being heavier sinks to the bottom leaving the gourd pieces on the top. Keep a bowl of water besides you and wet your hands as well as the cloth if necessary. Place out all the dough and let it dry for 2 days. If it is difficult to detach them spray/sprinkle a little water on the underside of the cloth and leave it or few minutes. It will now be easy to remove them. Next two days reverse them bottoms up and dry in the Sun. Drying out in the Sun. Once they are tinder dry store them in an air tight container. When needed, deep fry in hot oil. It is better to heat oil in a deep frying pan, lower the heat put the crispies in a wire mesh and lower into hot oil and take out immediately to avoid burning. 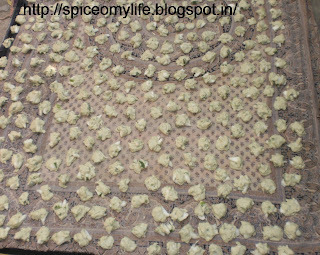 Place them on a blotter to drain excess oil and serve with steamed/cooked rice, Daal and Sambar or Rasam. Or just eat them as a snack with tea. Grate the gourd with the rind after cutting them into big chunks. Tie them in a muslin cloth and squeeze out the juice into a separate vessel. Tie it into a tight bundle and leave over night. Next morning again squeeze and collect the juice. the rest of the method is same. It is round to oblong shape, green in colour with a white ash like coating. Hence the name. 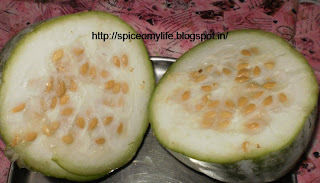 The size of Ash Gourd is as per your requirement. It depends upon the size of your family and how many crispies you want to make. The gourds are available from very small to biggest size. The gourd should be a matured one with tough outer rind. Matured gourds will have more coating of ash. 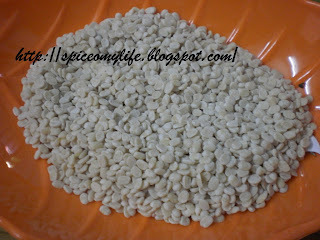 It will have less water content and are easy to dry when making the crispies. Also the thick rind and spongy inner white flesh don't burn when deep fried after making it into crispies. In order to know whether the gourd is matured or not, observe the coating of ash. It will have much ash. Its rind should be very tough. We usually dig in with our thumb nail. If it does not go in easily then it is matured. The gourd cannot be cleaned. It can at best be cleaned with a soft cotton cloth lightly. The seeds can be used in the crispies but we usually discard them because when we dry the crispies in the sun, the squirrels or birds, dig out the seeds and make a mess of our crispies. The gourd is either cut into pieces or grated. Green chillies go best with this. But you can use powder of dried red chilies. Adjust the quantity of chillies according to your taste. The quantity I gave you is quite spicy. Black gram for this recipe is best if it is split but not de husked. 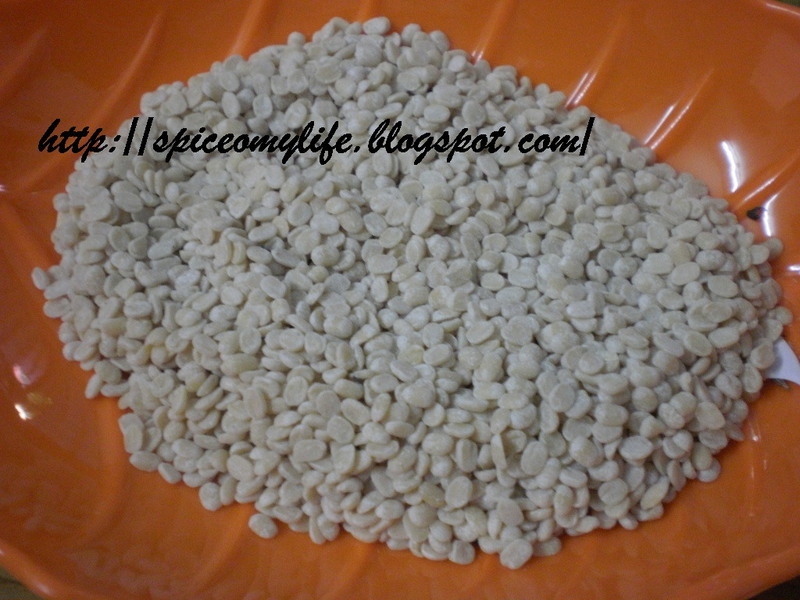 The gram does not have much of its stickiness or binding quality, if we use cleaned (de-husked one). 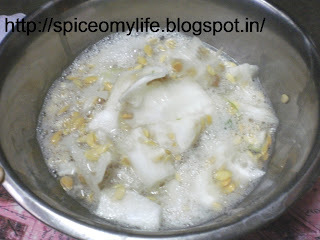 I use split gram with husk as it is much healthier and tastes very delicious. But you can use de husked split gram. The gram should be soaked over night. Next morning it is washed thoroughly to remove the husk or even when de husked one is used. The husk can also be made into vadies. Keep it separately. The gram is then placed in bamboo baskets or baskets made of dried palm leaves or a sieve and left for some time to drain all the water. Then it is ground well into a very thick but very soft paste using the gourd juice and a little water if necessary. I use wet grinder as it is easy to grind in this with very little water. If the paste is too watery, it cannot be made into crispies and also becomes very hard when dried and fried. 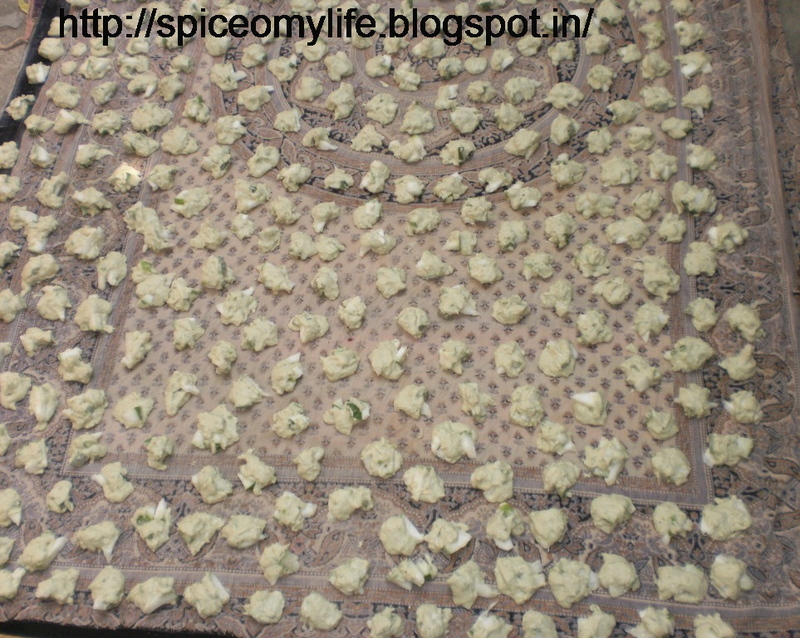 The cloth to be used for placing the crispies must be made of cotton and not too thin. This enables the underside also to dry along with the upper side simultaneously. We use old saris or dhotis(folded into half i.e doubled) or bed linen as they have ability to absorb the moisture. Don't lay out the entire cloth at a time. It gets dried quickly. Unfold a little at a time as you need it. If the cloth dries off despite all this sprinkle little water to make it wet. Too much water on cloth will make the crispy runny and it will not come out cleanly after drying. If the cloth is dry, the crispy cannot be separated from the cloth cleanly after drying and breaks into pieces. If you use a plastic sheet these crispies will not come out well though some people use it. The under side will not dry easily. The crispies should be dried in very hot Sun. Plan these only when you have enough Sun shine for at least 6 hours of the day and that too very hot. It should take only 3 to 4 days for them to dry. If it takes long to dry, they will become very hard. The gram should be ground with as little water as possible , using the gourd juice but should be ground to a very fine paste. Yes it looks very tedious but the result is mouth watering , hygienic and healthy. I will upload pictures of fried crispies next time in here.